Chocolate Malt Tart — always with butter. So I have about 25 or so food blogs I look at regularly and even more on my iPod touch (Which was an amazing Christmas gift boyfriend). Tartelette is one of the tops for me. Her photography is always so fabulous and perfectly styled, I'm always in awe of them. So when I saw that she put out a book on food photography how to, Plate to Pixel, I ran to my parents going 'oh my god, look look look.' and them obviously not understanding why I was so excited. But it's like getting tips from a pro, one of your food blog heroes. So within minutes my amazon cart got bigger and my wallet got smaller. It arrived the other day and does not fail to impress. It has lovely tips on styling, lighting, editing, and so much more. I completely reccomend this book for anyone trying to better their food photos, like I always am. Ok will post links later, an hour lunch time at work is just so long. Who needs an hour to eat? And it's too far from home so I just sit in my car outside of McDonalds and scam on their free wifi. Fabulous, right? Malt. This is my first experience ever baking with malt powder. I am so used to either malt milk shakes, chocolate malt crunch ice cream or those little chocolate covered balls, I never really thought to use it. When I came upon this recipe it seems simple but really tasty. The crust is really hard and crunchy, in the best way. Crispy, buttery and malty. 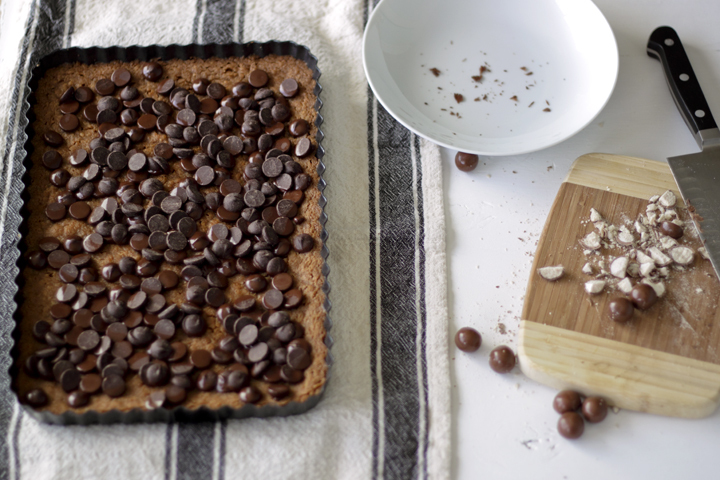 Just the simple melted chocolate is the perfect topping. Me: I'm going to make a chocolate malt tart tomorrow! Me: It's like that powdering thing, like you can get in a shake, or those chocolate balls. Boyfriend: Oh those hard things. Ewww...no. Oven 325F. 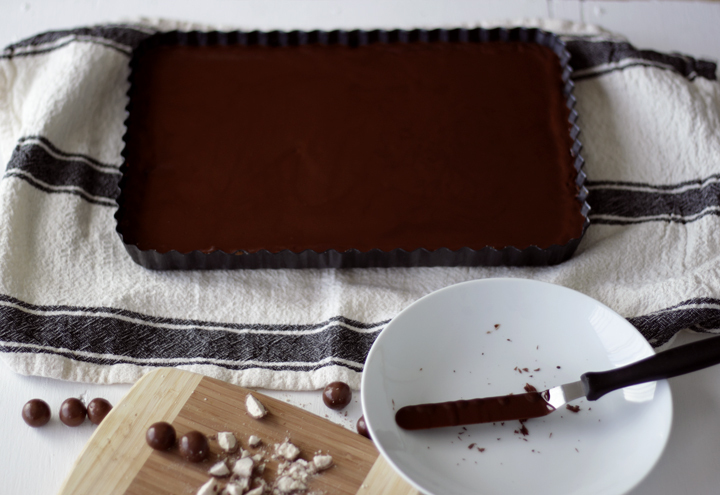 9 x 6 inch rectangle tart pan or 9 inch round. Combine in a food processor, flour, malt powder, sugar and salt. Pulse to combine. Add butter and pulse until moist clumps form. Form into a ball then press into the bottom of the pan. Bake until golden brown, about 25 minutes. Immediately after removing from oven, scatter chocolate evenly over crust and let sit for 5 minutes. Smooth out melted chocolate with a spatula and sprinkle with chocolate. Scatter milk balls around edges and let cool completely.